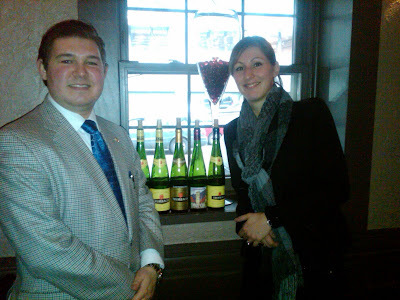 Yesterday, I had the privilege to dine with Anne Trimbach, the 13th Generation representative of Trimbach Estate Wines, while sampling her portfolio of Alsatian wines available in the US. I also had the honor of meeting her great uncle, Hubert Trimbach, almost three years ago in a similar setting, while he toured Chicago to promote the winery. 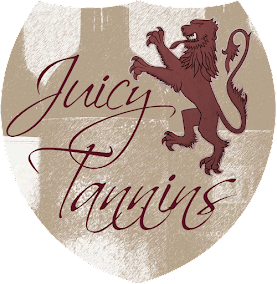 And now, the responsibility of introducing the world to their wines rests with Anne, a refreshing and enthusiastic young individual who has a passion for not only her family's wines, but also for the knowledge of other labels throughout the New and Old World. I was invited to meet both Anne and Hubert by my cousin Jeff, the Wine Specialist for one of our largest wine and spirits distributors, Wirtz Beverage. Trimbach Estate has been producing wine since 1626... yes, almost 400 years of a wine legacy. Located in the second driest region of France, Alsace, the climate allows for fantastic conditions to grow clean, crisp, dry, white wines, and so is known as one of the greatest wine appellations for Riesling, among the other varietals Trimbach harvests. Anne's father, Pierre, is this generation's winemaker, and is producing a phenomenal array of palate-pleasing dry white wines at approximately one million bottles per year. He produces much more than what we were able to sample in our short lunch, including a small production Pinot Noir, Late Harvest, and Noble Rot; some of these productions are so small, they do not export out of France. When you see the word "Riesling," please understand these are not your "American-ized" Rieslings. While the flavor may have characteristics of sweet fruit, the wine itself is dry. In fact, the three Rieslings we sampled from Trimbach were all under 4 grams per liter residual sugar (a reference point for how sweet a still or sparkling wine will be). In comparison, Chateau Ste. Michelle, a staple in American Riesling, is 18.5 grams per liter residual sugar. Even the Dry Riesling from Ste. Michelle is 7.8 grams per liter. Not to say one is better than the other, it simply depends on your personal preference. 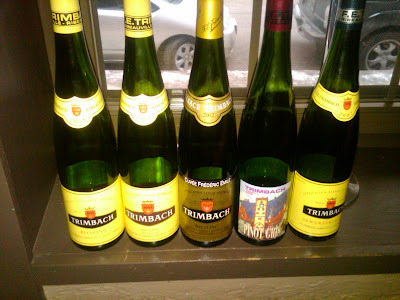 My wife, Erica, very much enjoys sweet, sugar-coated Rieslings, and so while I think should would enjoy the flavor of Trimbach, she may ultimately prefer a less dry approach. I, on the other hand, tend stray far from "syrup" and crave the fruit-acid balanced, dry juices. Next, the Trimbach, Riesling, 2008, Yellow Label. The nose of green apple, lemon zest, and citrus juice led into a wonderful palate of apple, green grape, and lemon balm. The body was crisp and dry with the finish of your tastebud's memory of Granny Smith Green Apples. This Riesling received a well-deserved 90 points from Wine Spectator. Trimbach, Riesling, Reserve, 2008: a beautiful nose of minerals, silk, and red apple. The Reserve was not as dry as the above Riesling, but was much more refined in the palate of apple and edible flowers. The finish was clean and left you craving more. Wine Spectator gave the Reserve a fantastic 92 points. Trimbach, Riesling, Cuvee Frederic Emile, 2002, Gold Label: again stepping up a tier in the refine-ness of an amazing Riesling, the nose is beautiful, slightly perfume-y, with silky white flower blossoms. The richer golden hue in the color described its age, and the palate had incredible acid, and was even more refined than the Reserve '08, with flavors of citrus, lemon, and tender apples (my mind went to Michigan Gala Apples). The wine is dedicated to the 8th generation wine maker, Frederic Emile, who according to Anne, played a huge role in the development of turning the then small family winery into a large successful business. Bleu cheese was an excellent accompaniment. Trimbach, Pinot Gris, Reserve, 2006: a golden hue, almost like a classic California Chardonnay, with sweet aromas of peach and pear. The palate is creamy and soft, no make that incredibly soft, with and excellent balance of acid and fruit. Flavors of apple, peach skin, and just a hint of smoke and vanilla, and small notes of minerals on the dry finish. Very well done Pinot Gris. Trimbach, Gewurztraminer, 2007: of all the wines in the tasting, the Gewurz was by far the most aromatic, and the sweetest, but again, it was still crisp on the finish. It begins with a caramelized sugar cane, tangerine, and wild flowers aroma, and then with another swirl of the glass, I picked up elegant tropical flower and yellow rose scents. The palate was silk, silk, silk, with creamy passionfruit, mango, and almonds, and as I said before, a crisp, acid finish. I had a fantastic time tasting with Anne Trimbach; I wish her the best of luck as the "torch-bearer" of the new Trimbach generation, and hope to meet her again soon. You may learn more of the entire Trimbach portfolio and their family's 400 year journey on their website. Thank you Anne for a fabulous line-up of wines for our Chicago tasting, thank you Jeff and your awesome team at Wirtz for hosting the event, and thank you Kinzie Chophouse for a great setting! Cheers!